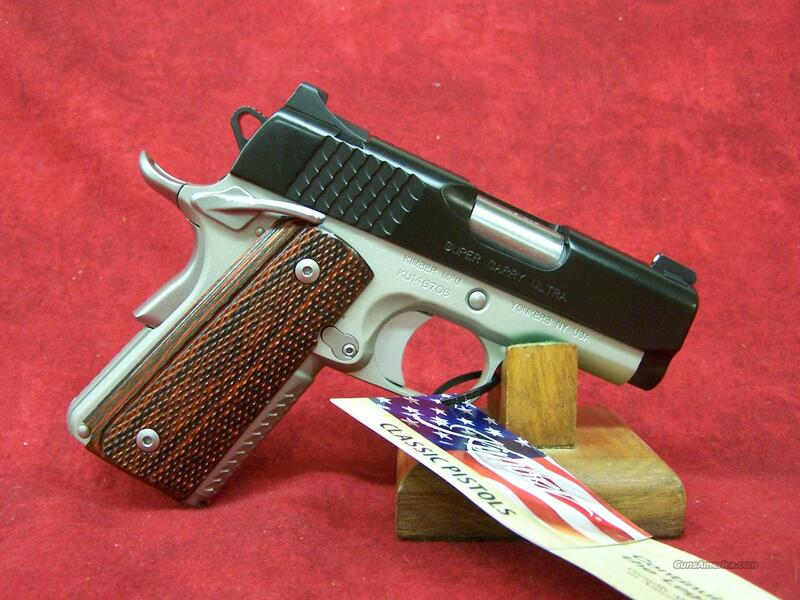 Description: Kimber Super Carry Ultra .45ACP(30248). The pistol is brand new in the hard case(file photo). Specifications: Height (inches) 90° to barrel: 4.75 Weight (ounces) with empty magazine: 25 Length (inches): 6.8 Magazine capacity: 7 Ambidextrous thumb safety Carry Melt Recoil spring (pounds): 18.0 Full length guide rod Frame: Material: Aluminum Finish: Satin Silver KimPro II™ frame finish Width (inches): 1.28 Super Carry serrations High cut under trigger guard Rounded mainspring housing and frame Slide: Material: Stainless steel Finish: Matte black KimPro II™ slide finish Flat top Super Carry serrations on slide and flat top Barrel: Length (inches): 3 Material: Steel, match grade Twist rate (left hand): 16 Ramped Sights: Night sights, Tritium, cocking shoulder Radius (inches): 4.8 Grips: Micarta/laminated wood Trigger: Solid Aluminum Match Grade Factory setting (appx. pounds): 4.0 - 5.0 Firearms will need to be transfered through a FFL holder. Buyer to pay $25.00 S&H to lower 48. Prices reflect cash discount. There will be 3% added to credit card sales. Email us with any questions or call 1 605 793 2263 if we don't get back to you within 24 hours, either we didn't get your email, or you are not getting ours(we try to answer all our emails as quick as possible). Over 2500 guns on hand, contact us for any of your needs. If we don't have what you want, we can try to find it.